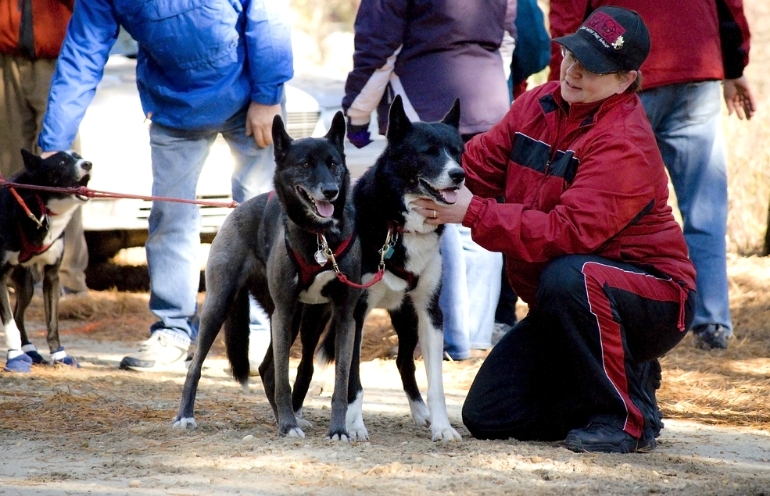 Jersey Sands Sled Dog Racing Association is based in Southern New Jersey. We are a sled dog club of approximately 20 mushers who are dedicated to preserving the good name of sled dog racing. We run approximately 3 - 4 sled dog races a year, all of which are open to the public. Depending on the conditions, the races may be run on dry land with a gig or snow using a sled. Our members train their sled teams on the trails of the New Jersey Pinelands. We regularly train at our race sites on the weekends when weather permits. You are welcome to come meet our dogs and watch them run. You can go to the page and drop one of us an e-mail for more info. Are you a future musher? Have you thought about mushing with your dogs or want to know more about the sport? Sled dog training is a great family activity and helps with the fitness of the family pet. The dogs love to run and families like the time together. Contact one of the JSSDRA members about joining them on a training day to learn more. Would you like to come to a training session? We regularly train at our race sites on the weekends when weather permits. You are welcome to come meet our dogs and watch them run. You can go to the club officials page and drop one of us an e-mail for more info.